For this post I would like to talk about trappiste style beers. Specifically Rochefort 8 and 10, St Bernardus Abt 12, Ommegang Three Philosophers and the prized Westvleteren XII. I would like to use them as an example of how once you’ve tried the best of something the rest are so pale in comparison. I would also like to preface this update with the fact that these styles are not my favorite by a long shot but I do enjoy them seasonally, during the winter. I find residual/unfinished sugar almost unpalatable in a beer but I can appreciate what the Belgian darks and quads are trying to produce as I am a Belgian yeast fan. Also sometimes a beer will transcend the limits of its style and become just plain great beer by the care taken in its production and the flavour produced. I find when these Belgian style beers are bottled in smaller 330ml bottles they finish over bubbly with larger bubbles, like soda water, rather than the more champagne-like bubbles that are more desired. This may be a bias or personal taste but I’ve found even when my favorite UK offerings are bottle conditioned they turn out a poor comparison from whats available straight from the cask. The English are true masters of real ale though so let’s not even start with that. Another point to note about these dark Belgians is the mostly undesirable yeast residue left in the bottom few milliliters of the bottle. Try not to pour them all the way out I found this especially noticeable with the Rochefort 8. Rochefort 8 is certainly an interesting and delicious beer, there is no doubt about that, the only real weak point is that my personal tastes just don’t align with the style. I prefer the hop forward profiles but I can taste some similarities in these really dark and malty beers. Rochefort 8 has a surprisingly long finish which I really enjoyed. The flavours offered by dark malts and Belgian yeast can produce really interesting long and bitter aftertastes similar to west coast hop bombs. All of these beers have a certain boozy quality that is not common in most of my favorites. 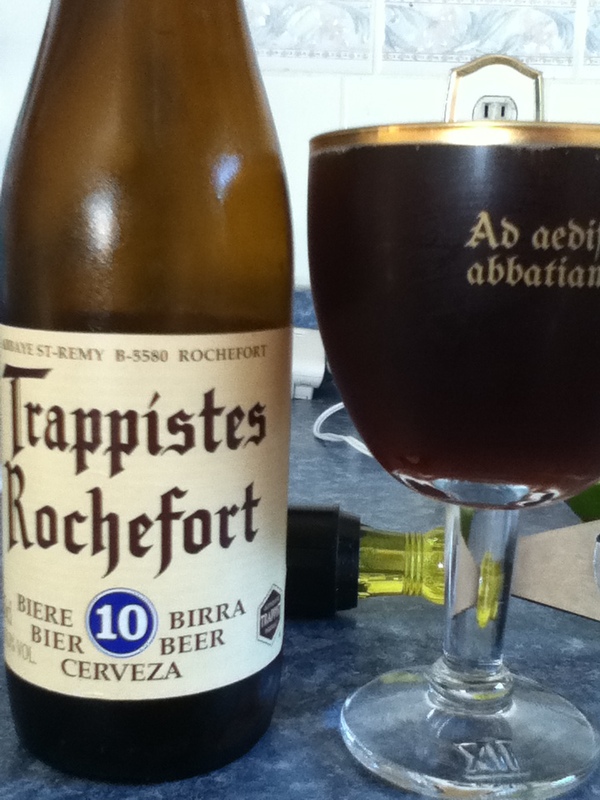 I found Rochefort 8s boozy profile to be actually quite enjoyable and added a lot to the overall flavour of the beer. At this point I’m really looking forward to trying the Rochefort 10 and hopefully to taste the more interesting dark fruit characteristic that I love about the maltier quads. Ahhhhh… Rochefort 10. Amazing beer, unique profile and high ABV(11.3%!!) make this beer a real winner to me. Dates, cinnamon, licorice, sweet(not overly so), malty and boozy. Easier to obtain than Westy 12 and certainly more affordable. The bottle that I tried most recently was not to overhanded with the carbonation and once I let it breathe for a minute in the glass it really calmed down. I don’t think I could palate more than one of these in a sitting but they are a joy to drink. I was blown away with the apparent quality difference and flavour difference between the Rochefort 8 and 10. I know they are different styles but the 10 is light years ahead for my tastes and I don’t think it’s just the difference between a Belgian dark ale and a quad. Definitely get this if you have it available to you it’s a brilliant example of strong Belgian beer. The St Bernardus Abt 12 was the weakest of the quads for sure. I’m not certain what profile was supposedly being brought to the table with this brew. I won’t say it was bad beer but it wasn’t doing a lot for me. I found as it warmed up it got a little bit tastier but it had some really undesirable undertones in the flavour, one I could only describe as plastic-y, it was subtle but I couldn’t stop tasting it. I don’t believe my bottle was skunked but I don’t drink a ton of these Belgian quads and I suspect I may need some more time with this typically highly rated beer. Westvleteren XII. Wow. Maybe this is cliche to say, and I’m sure that if any other beer connoisseurs ever peruse this particular corner of the internet they’ll chuckle to themselves knowingly, but “westy 12” is perhaps the best beer I have ever tasted. Malty, chocolate-y, fruity and extremely smooth. I purchased a six pack in 2012 when it was first available in Canada. I drank and shared five of those and each time it was awesome. Not much residual sugars but certainly sweet. I think molasses is a really outstanding flavour of the profile but certainly fig, prunes and dried mango could be argued for. This comes to my point. 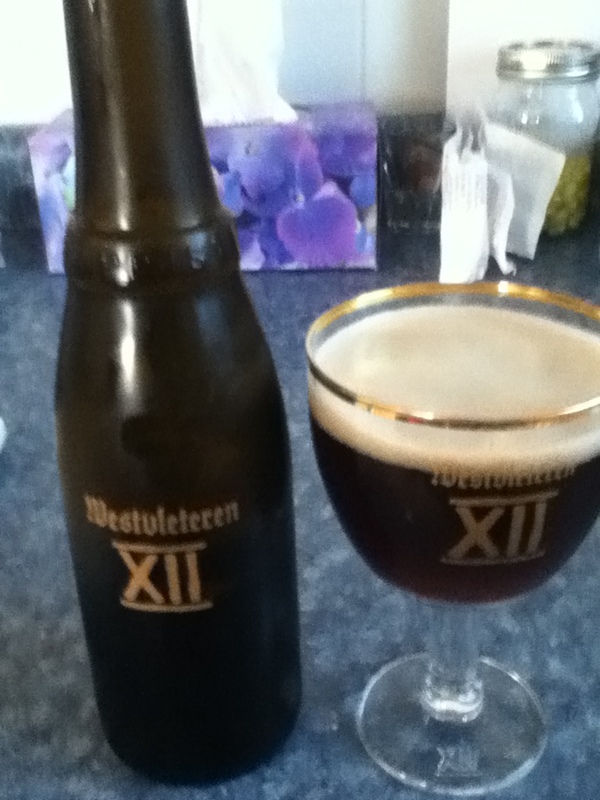 For my tastes Westvleteren XII is the best Belgian Quad. In fact every other beer I try is compared to it. It’s delicately carbonated, gets better with age, is smooth and interesting and has wonderful mouth feel. I’m not really sure what more I can say. If you were lucky to have an opportunity to try it when it was available here I’m sure you can relate to what I’ve said. All other Belgian quadrupels and quite frankly every beer I will ever drink will be compared to this beer. It transcends style, country of origin and preferences to just be a really great beer. Lots of people complain that westy 12 is over-hyped but I am obviously not one of them. I paid $80 for the limited edition six-pack and it was worth every cent. There are only a few places you can get this regularly in Canada and I would go way out of my way to get more. 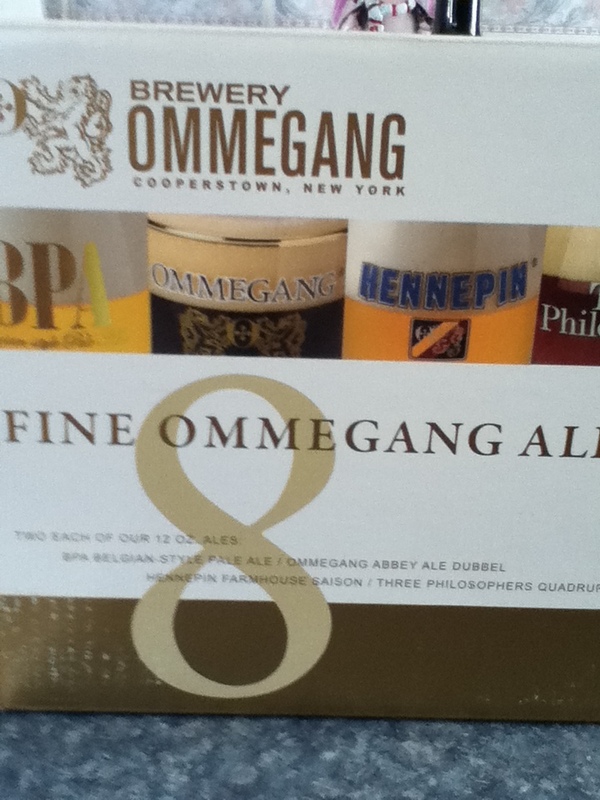 Last but not least is the Three Philosophers by Ommegang. I wanted to include a non-Belgian quadrupel offering that I think is of the same quality and depth as the Belgian quads. Ommegang produces exceptional beer, they use traditional Belgian brewing methods in an ages old location in Cooperstown, NY. Three Philosophers is actually a beer blend. A traditional Belgian quad blended with a small amount of kriek, Liefman’s Kriek to be precise. Kriek is a cherry lambic, a beer with fruit added to the secondary and it adds a lot of depth and uniqueness to Three Philosophers. This beer is bottle finished as are all of Ommegang’s offerings, I believe, and I love the more subtle effervescence and denser mouth feel that comes from a properly bottle finished beer. I would describe this beer as rich in character, extremely tasty with a subtle refreshing fruitiness but at 9.7% ABV it is definitely a dense beer. Solid world class beer in my opinion. Now more to my point. After tasting these beers I can’t settle for anything less. Once the bar is set alternatives can no longer satisfy. I would rather drink a smaller quantity of really great beer than the opposite. I hesitate to call this effect snobbery, pretension or hipsterism I think it is more of a nod to breweries that are interested in producing products of an extremely high quality. I mean the care and attention that is payed to producing all these beers is outstanding and it is reflected in the end result. The same effect can be achieved in coffee. A friend of mine and I invested in espresso machines several years ago we like to say anyone who has tried our coffee has had coffee ruined for them; meaning their regular cuppa is no longer sufficient as they now crave properly prepared, more traditional coffee. This is the best-in-class effect. Enjoy your beer! Liked your take on the Rochefort 10. Maybe my palate’s different from yours, but I don’t think I’ve had a problem with the carbonation. Hmmm…..maybe I need to drink another bottle or three to make sure? No harm in trying again. I find letting it sit a while once poured alleviates the problem anyway. Either way it’s great beer.